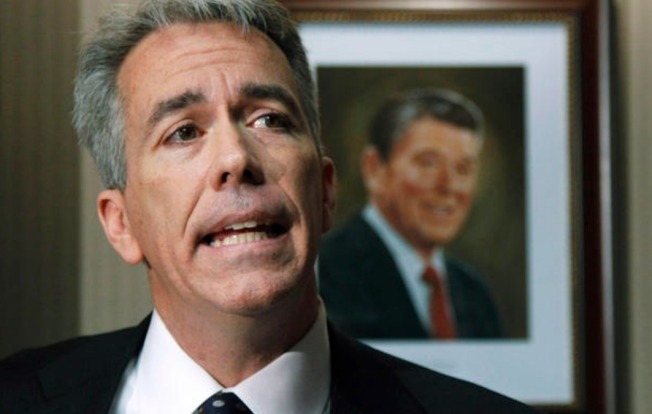 Walsh deleted the post and tweeted he "wasn't calling for violence"
Former Illinois Tea Party Rep. Joe Walsh came under fire Thursday night for an inflammatory tweet that included the phrase "watch out Obama" after multiple Dallas police officers were shot, five fatally, by two snipers at the end of a protest against nationwide officer-involved shootings. "3 Dallas Cops killed, 7 wounded," Walsh posted. "This is now war. Watch out Obama. Watch out black lives matter punks. Real America is coming after you." Walsh served one term in Illinois as the representative for the state's 8th District before being defeated by Rep. Tammy Duckworth in 2012. He went on to become the host of a conservative radio show on WIND-AM 560. The tweet was deleted, but not before a firestorm erupted on the platform that included singer John Legend calling for Walsh to be arrested. "Joe Walsh needs to be arrested for threatening our President," Legend tweeted. Walsh later tweeted that he "wasn't calling for violence, against Obama or anyone." "Obama's words & BLM's deeds have gotten cops killed," he wrote. "Time for us to defend our cops." Five officers were killed and several others wounded Thursday in what was believed by Dallas Police to be a coordinated shooting. "We believe that these suspects were positioning themselves to triangulate on our officers and planned to injure and kill as many law enforcement officers as they could," Police Chief David Brown said. This isn't the first time Walsh has drawn controversy. He infamously said in 2012 that his then-Congressional opponent Duckworth, who lost both legs when her Black Hawk helicopter crashed in Iraq, wasn't a "true hero." He made national news when he said “true heroes” don’t boast about their military records, as he accused Duckworth of doing. Duckworth won, with 55 percent of the vote.